Danish physician; born in Copenhagen Nov. 1, 1852. After graduating from the university of that city (M.D. 1880) he went abroad to study obstetrics, and on his return became privat-docent in gynecology at his alma mater. In 1897 he was appointed professor of obstetrics and children's diseases in the same university. Of Meyer's writings the following may be mentioned: "Det Normale Svangerskab, Födsel, og Barselseng," Copenhagen, 1882 (2d ed. 1891); "Menstruationsprocessen og dens Sygelige Afvigelser," ib. 1890; "Den Förste Barnepleje," ib. 1891. 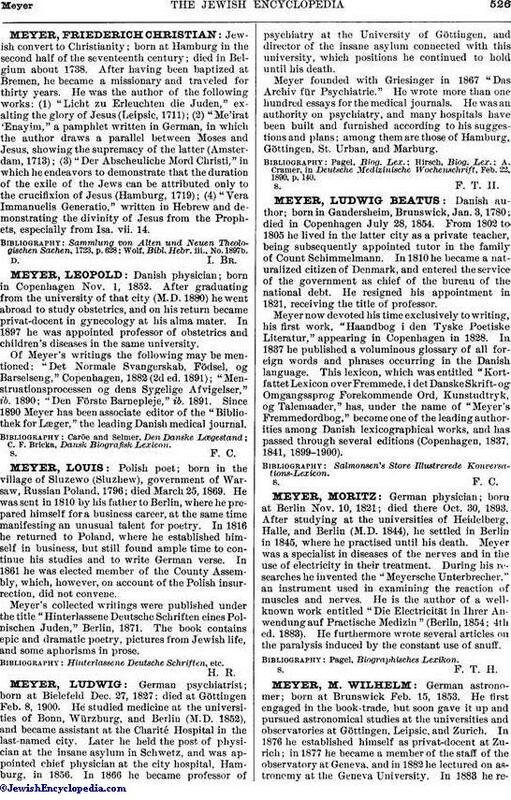 Since 1890 Meyer has been associate editor of the "Bibliothek for Læger," the leading Danish medical journal.